Creating an appliance image for a single purpose can be quite some effort- you need to take care of your application, need to build a safe root filesystem and make modifications to the system so it behaves the way you or the application expect it to behave. With Ubuntu Core,this effort becomes immediately a lot easier. Ubuntu Core is completely made out of snap packages; the kernel, rootfs and all applications are all snap based and benefit from the advantages this package format brings.. Snap packages are transactional. They can automatically rollback on error after an upgrade including the kernel snap. If a breakage is noticed after upgrading to the new kernel version, the system will detect this and automatically roll back to the former known-working version. The same goes for every other snap in the system, including the root filesystem. Snap packages are binary readonly filesystem images that support binary delta upgrades generated on the store server. This means an upgrade only downloads the actual binary delta between two snaps thereby reducing the download cost to a minimum. If your appliance is only attached via 3G, for example, this is a significant cost saver. Snap packages communicate with each other and with the system hardware through predefined interfaces that the image creator has full control over and your applications only see the hardware and data from other snap packages if you allow it to. Ubuntu Core images consist of three snap packages by default. There is a kernel snap, running your hardware, the core snap which contains a minimal root filesystem and the gadget snap which ships a bootloader, the desired partitioning scheme, rules for interface connections and configuration defaults for application snaps included in the image. If you pick hardware that is supported by existing Ubuntu Core (Generic x86_64, Raspberry Pi (armv7l) or the Dragonboard 420c (aarch64)) you will not only find the ready-made root filesystem core snap in the store already but also ready-made kernel snaps for your hardware. 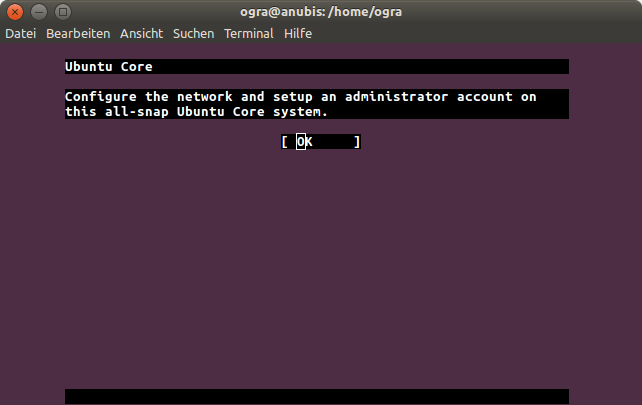 All it needs to create an Ubuntu Core appliance image is an application snap (and if you have a more complex setup a fork of the existing gadget snap for your device with adjustments for interfaces and app defaults). This set up reduces the development time drastically … pretty much down to a one-time operation for the gadget and a constant focus on your application. There is no need to care for any other image specific bits, they can be downloaded you get them for free from the Snap Store for free, always up to date and security maintained for 5 years. The following walk-through will show the creation of a mid-complex appliance image that does some automatic self configuration but also allows providing additional set-up (i.e. wireless LAN, system user) via plugging in a USB stick. For a Digital Signage demo where we want to control the attached displays through a web interface the dashkiosk  dashboard managing tool looks like a good candidate. It allows managing, grouping and assigning attached remote displays through a simple drag and drop web UI. The snap finds its clients via the mDNS protocol, so our appliance image will ship the avahi snap along with the server application. The attached “displays” are actually simple web-browsers. To not waste resources we will turn our server image into being a client at the same time and have it ship a web-browser snap pointing to the local dashkiosk server. To have the browser display something on the screen we will also need a graphics stack, so we will ship the mir-kiosk snap as well in our image. We want to not only create a server image but also have auto-connecting clients, so we will create a second image that only contains the browser and display stack. Now that we have identified what snap packages we want to pre-install in our two images, it is time to read up about how Ubuntu Core images are created. has a walk-through for this, take a special look at the “required-snaps” option of the model assertion we will create. The “dashkiosk-client-browser”  in the above two model assertions is a fork of the original chromium-mir-kiosk with the original “chromium.launcher” replaced with a script that first does an avahi-resolve-host-name call to receive the IP of the dashkiosk server via mDNS, beyond this it is largely original. When you now use “ubuntu-image” as described in  you will already end up with a bootable image that has these snap packages pre-installed. They should automatically start up on boot, but since they are securely confined they will not yet be able to properly communicate with each other or the hardware because not all interfaces are automatically pre-connected. While you can have default connections of snap packages defined via a store declaration, many of these interfaces are often not suitable security wise to have them auto-connected everywhere such a snap is installed. Luckily Ubuntu Core gives an option to do these additional interface connections with a “connections:” entry in the gadget snap of your image . To use these “connections:” entries in your gadget.yaml all the snaps you want to use need to have a snap id. This means you first need to upload them to the store, in the details of the store UI for your snap package you can then see the ID hash that you need to use in the gadget.yaml entry. A forked pi3 gadget example with a gadget.yaml that includes various default connections for dashkiosk, the browser and a few other bits can be found at . Such a set-up can be done for any interface combination of your shipped snap packages in the image. If you scroll down further in the example gadget.yaml above you also find a “defaults:” field where we define that rsyslog should not log to the SD card to prevent wearing it out with massive logging and set the default port for the dashkiosk server to port 80. If your application snap packages use configuration via “snap set/get”  you can set all desired defaults through this method. There are some adjustments we need to do to the image, for this we will create a “config snap” that we ship by default. This snap will run a few simple scripts during boot and set the additional defaults we need by utilizing the available snap interfaces of the system  and . Since the clients find their server via an mDNS lookup we need to make sure the correct avahi hostname is set on our server (see the “set-name” script in the above config snap trees). We use the “avahi-control” interface for this and connect it in  with a slot/plug combination. While the above is already enough to have the images properly work on a wired network (Ubuntu Core always defaults to a DHCP configured ethernet without any further configuration), I personally plan to also be able to use this image on the Raspberry Pi3 with a wireless connection. Network connections are configured by using netplan  on Ubuntu Core. To configure a WLAN connection we can either manually configure each client board through a serial console (which offers the interactive setup through console-conf/subiquity) or we can write a little tool that monitors the USB port for plugged in USB sticks and checks if it finds a netplan configuration file that we define. For this we create the “netplan-import” script in  and , this tool uses the “system-observe”, “mount-observe”, “udisks2”, “removable-media”, “network-setup-control” and “shutdown” interfaces, see again plugs and slots in our gadget.yaml for this … and since udisks2 is only provided by the udisks2 snap, we also need to make sure to add this snap to the “required-snaps” of our model assertion. Make sure to have all interface connections set right like in . Sign your model assertion as described in  and do a local build of your gadget snap (do not upload it to the store, it will get stuck in manual review there. If you actually want to use a gadget snap in a commercial project, contact Canonical about obtaining a brand store ). When you build your image, use the –extra-snaps (see ) option to point to your locally built gadget package. After the initial flashing of the image to your device/SD card, your kernel and rootfs will automatically receive updates without you doing anything. Any fixes you want to do to the applications or configuration snap packages, can just be uploaded to the store, your image will automatically refresh and pick them up in a timely manner. Be patient for the first boot in case you are on the ARM architecture. Snapd installs all the pre-seeded snap packages on first boot, this includes a sha3 checksum verification of the snap files. Snapd is written in go and the sha3 function of go is extremely slow (1-2min per pre-seeded snap) on armhf. All subsequent boots will be as fast as you would expect them (around 30 sec to having the graphics on screen). If you want to log in via ssh you can create a system-user assertion that you can put on the same USB key your netplan.yaml lives on, it will create an ssh user for you to allow you to inspect the booted system . There is a tool provided as a snap package to make creating a system user assertion easy for you at . Last but not least, you can find ready-made images that followed the above step by step guide under . This is the second post in the series about building u-boot based gadget snaps, following Building u-boot gadget snap packages from source. If you have read the last post in this series, you have likely noticed that there is a uboot.patch file being applied to the board config before building the u-boot binaries. This post will take a closer look at this patch. As you might know already, Ubuntu Core will perform a fully automatic roll-back of upgrades of the kernel or the core snap (rootfs), if it detects that a reboot after the upgrade has not fully succeeded. If an upgrade of the kernel or core snap gets applied, snapd sets a flag in the bootloader configuration called “snap_mode=” and additionally sets the “snap_try_core=” and/or “snap_try_kernel=” variables. To set these flags and variables that the bootloader should be able to read at next boot, snapd will need write access to the bootloader configuration. Now, u-boot is the most flexible of all bootloaders, the configuration can live in a uEnv.txt file, in a boot.scr or boot.ini script on a filesystem, in raw space on the boot media or on some flash storage dedicated to u-boot or even a combination of these (and I surely forgot other variations in that list). This setup can vary from board to board and there is no actual standard. Since it would be a massive amount of work and code to support all possible variations of u-boot configuration management in snapd, the Ubuntu Core team had to decided for one default process and pick a standard here. Ubuntu Core is designed with completely unattended installations in mind, being the truly rolling Ubuntu, it should be able to upgrade itself at any time over the network and should never corrupt any of its setup or configuration, not even when a power loss occurs in the middle of an update or while the bootloader config is updated. No matter if your device is an embedded industrial controller mounted to the ceiling of a multi level factory hall, a cell tower far out in the woods or some floating sensor device on the ocean, the risk of corrupting any of the bootloader config needs to be as minimal as possible. Opening a file, pulling it to RAM, changing it, then writing it to a filesystem cache and flushing that in the last step is quite a time-consuming thing. The time window where the system is vulnerable to corruption due to power outage is quite big. Instead we want to atomically toggle a value; preferably directly on disk with no caches at all. This cuts the potential corruption time down to the actual physical write operation, but also rules out most of the file based bits from the above list (uEnv.txt or boot.scr/.ini) and leaves us with the raw options. That said, we can not really enforce an additional partition for a raw environment, a board might have a certain boot process that requires a very specific setup of partitions shipping binary blobs from the vendor before even getting to the bootloader (i.e. see the dragonboard-410c. Qualcomm requires 8 partitions with different blobs to initialize the hardware before even getting to u-boot.bin). To not exclude such boards we need to find a more generic setup. The solution here is a compromise between filesystem based and raw … we create an img file with fixed size (which allows the atomic writing we want) but put that on top of a vfat partition (our system-boot partition that also carries kernel, initrd and dtb) for biggest flexibility. To make it easier for snapd and the user space side, we define a fixed size (the same size on all boards) for this img file. We also tell u-boot and the userspace tools to use redundancy for this file which allows the desired atomic writing. I have an old Freescale SabreLite (IMX6) board lying around here, its native SCSI controller and gigabit ethernet make it a wonderful target device for i.e. a NAS or really fast Ubuntu Core based netxtcloud box. So this board defines a raw space on the MMC to be used for the environment if we build for the SabreLite, but we want to use CONFIG_ENV_IS_IN_FAT with the right parameters to make use of an uboot.env file from the first vfat partition on the first SD card. So here we tell u-boot that it should use mmc device number 1 and read a file called uboot.env. FAT_ENV_DEVICE_AND_PART can actually take a partition number, but if we do not set it, it will try to automatically use the very first partition found … (so “1” is equivalent to “1:1” in this case … on something like the dragonboard where the vfat is actually the 8th partition we use “1:8”). While the above patch would already work with some uboot.env file, it would not yet work with the one we need for Ubuntu Core. Remember the atomic writing thing from above ? This requires us to set the CONFIG_SYS_REDUNDAND_ENVIRONMENT option too (note i did not typo this, the option is really called “REDUNDAND” for whatever reason). Setting this option tells u-boot that there is a different header on the file and that write operations should be done atomic. One other bit that Ubuntu core expects is that we can load a proper initrd.img without having to mangle or modify it in the kernel snap (by i.e. making it a uInitrd or whatnot) so we need to define the CONFIG_SUPPORT_RAW_INITRD option as well since it is not set by default for this board. With this we are now able to build a u-boot.bin that will handle the Ubuntu Core uboot.env file from the system-boot partition, read and write the environment from there and allow snapd to modify the same file from user space on a booted system when kernel or core snap updates occur. The next post in this series will take a closer look at the contents of this uboot.env.in file, what we actually need in there to achieve proper rollback handling and how to obtain the default values for it. If you have any questions about the process, feel free to ask here in the comments or open a thread on https://forum.snapcraft.io in the device category. I recently had to help setting up an image build environment for UbuntuCore images for someone who only allows docker as infrastructure. When wanting to build an image from a blessed model assertion for i.e. the pi2, pi3 or dragonboard you need to use the “snap known” command (see below for the full syntax) to download the canonical signed assertion. The snap command requires snapd to run inside your container. To build images we need to use ubuntu-image which is also provided as a snap, so we not only want snapd to run for the “snap” command, but we also want the container to be able to execute snaps we install. After quite a bit back and forth and disabling quite a few security features inside the container setup, i came up with https://github.com/ogra1/snapd-docker which is a simple build script for setting up a container that can execute snaps. I hope people needing to use docker and wanting to use snaps inside containers find this helpful … pull requests for improvements of the script or documentation will be happily reviewed on github. WARNING NOTE: This will create a container with security options disabled, this is an unsupported setup, if you have multiple snap packages inside the same container they will be able to break out of the confinement and see each others data and processes. Use this setup to build or test single snap packages but do not rely on security inside the container. If you want to create subsequent other containers using the same image, use the –containername option with a subsequent run of the ./build.sh script. This will install the htop snap and will show the running processes inside the container after connecting the right snap interfaces. Install some required debs, install the snapcraft snap package to build snap packages, pull some remote branch and build a snap from it using the snapcraft command. Install some debs required to work around a bug in the ubuntu-image classic snap, install ubuntu-image, retrieve the model assertion for a pi3 image using the “snap known” command and build the image using ubuntu-image. $ sudo docker exec snappy sh -c "snap known --remote model series=16 model=pi3 brand-id=canonical >pi3.model"
When we started doing gadget snap packages for UbuntuCore images, there was no snapcraft. Gadgets were assembled from locally built bootloader binaries by setting up a filesystem structure that reflects the snap content, using pre-created meta/snap.yaml and meta/gadget.yaml files and then calling mksquashfs. When snapcraft started to support the gadget format we added a very simple snapcraft.yaml that simply used the dump plugin to copy the prebuilt binaries into place in the resulting snap. While we provide uboot.patch files in the gadget source trees, there is not really anything built from source at snap build time and doing your own modifications means you need to reach out to someone who has the necessary knowledge how the u-boot.img and the SPL were built. This was a long standing wart in our setup and there was desire for a long time to actually make the gadget creation a completely reproducable process based on upstream u-boot sources. After this the resulting binaries used to be copied into the prebuilt/ dir. The snapcraft build was completely disconnected from this process. We use the “make” plugin (which nicely provides the “artifacts:” option for us to cherry-pick the binaries from the u-boot build to be put into the snap), point to the upstream u-boot source and make it use the v2017.01 branch. With this “prepare:” scriptlet we tell the plugin to apply our uboot.patch to the checked out branch and to configure it for a beaglebone black before starting the build. If you have worked with u-boot gadgets before you know how important the uboot.env file that carries our UbuntuCore bootloader setup is. It always needs to be the right size (-s 131072), redundant (-r) to allow atomic writing and we ship the input file as uboot.env.in in our source trees. In the “install:” scriptlet we take this input file and create a proper environment image file from it using the mkenvimage tool our build has just created before. The ubuntu-image and “snap prepare-image” commands will look for an “uboot.conf” file at image creation time, so we create a symlink pointing to our binary env file. Dependencies to build u-boot get defined in the “build-packages:” option of the part. Obviously we need a compiler (build-essential), some build scripts still use python2.7 headers (libpython2.7-dev) and when test building there is a complaint about bc missing that is not fatal (but disturbing enough to also install the bc package as a build dependency). bootable Ubuntu Core image for the Beaglebone Black. This snapcraft.yaml is enough to build a beaglebone gadget snap natively on an armhf host, so it will work if you run “snapcraft” in the checked out source on a raspberry Pi install or if you let launchpad or build.snapcraft.io do the build for you … but … typically, while developing you want to build on your workstation PC, not on some remote source or on a slow arm board. With some modifications of the snapcraft.yaml we can luckily make that possible very easily, lets make a copy of our snapcraft.yaml (i call it crossbuild-snapcraft.yaml in my trees) and add some changes to that. First of all, we want a cross compiler on the host machine, so we will add the gcc-arm-linux-gnueabi package to the list of build dependencies. We also need to override the “make” call to carry info about our cross compiler in the CROSS_COMPILE environment variable. We can use a “build:” scriptlet for this. When cross building, the “artifacts:” line sadly does not do what it should anymore (i assume this is a bug), as a quick workaround we can enhance the “install:” script snippet with a simple cp command. So with the original snapcraft.yaml we can now let our tree auto-build in build.snapcraft.io, when we checkout the source locally and want to build on a PC a simple “cp crossbuild-snapcraft.yaml snapcraft.yaml && snapcraft” will do a local cross build. Just building the bootloader binaries is indeed not enough to create a bootable image, the binaries need to go in the right place, the bootloader will need to know where the devicetree file can be found and a working image should also have a proper partition table. For this purpose we will need to create a gadget.yaml file with the right information. We create a gadget.yaml file in the source tree and tell the system that the devicetree file is called am335x-boneblack and that it gets shipped by the kernel snap. Now we add a “volume:” entry that tells the system about the bootloader type (grub or u-boot) and defines which type of partition table we want (either “gpt” for a GUID partiton table or “mbr” for an msdos type one). The last bit we need to do is to give our volume a “structure:”, i.e. a partition table but also info where to write the raw bootloader bits (MLO and u-boot.img). For writing the bootloader blobs into the right place ubuntu-image will not just use dd so we need to translate the lines into proper entries for the volume structure. Lets take a closer look. The MLO line tells us dd will use 128k (131072 bytes) sized blocks (bs=), it will use 1 block offset from the start of the card (seek=1) and will reserve one block for the MLO payload in use (count=1). and indeed there is no filesystem in use, it will be written “bare”. This gives us the first entry in the volume structure. The u-boot.img dd command uses a block size of 384k (393216 bytes), one block offset from the start of the image and reserves two blocks as possible size for the u-boot.img binary and will also write the binary raw into place (type: bare). Currently every UbuntuCore u-boot image expects to find the bootloader configuration, kernel, initrd and devicetree file in a vfat partition (type: 0C) called system-boot. To have enough wiggle room we’ll make that partition 128M big that will leave enough space for even gigantic kernel binaries or initrd’s. The ubuntu-image tool will put our uboot.env file from the start into that partition. As you can see building a gadget snap is fairly easy and only requires four files (snapcraft.yaml, gadget.yaml, uboot.patch and uboot.env.in) to have in a github tree that you can then have auto-built on build.snapcraft.io. In subsequent posts i will explain the patch and uboot.env.in files in more detail. I will also describe the setup of default interfaces a gadget can provide as well as how to set some system defaults from the gadget.yaml file. If you want to take a look at the full source tree used for the above example, go to . Documentation of the gadget snap syntax can be found at . The dd commands used as input for the gadget.yaml file can be found at  and documentation how to build an image out of a gadget snap is at . If you have any questions feel free to ask at  (i recommmend using the “device” category). Use UbuntuCore to create a WiFi AP with nextcloud support on a Pi3 in minutes. UbuntuCore is the rolling release of Ubuntu. It is self updating and completely built out of snap packages (including kernel, boot loader and root file system) which provides transactional updates, manual and automatic roll-back and a high level of system security to all parts of the system. Once installed you have a secure zero maintenance OS that you can easily turn into a powerful appliance by simply adding a few application snaps to it. The raspberry Pi3 comes with WLAN and ethernet hardware on board, which makes it a great candidate to turn it into a WiFi AccessPoint. But why stop here ? With UbuntuCore we can go further and install a WebRTC solution (like spreedme) for making in-house video calls or an UPNP media server to serve our music and video collections, an OpenHAB home automation device … or we can actually turn it into a personal cloud using the nextcloud snap. 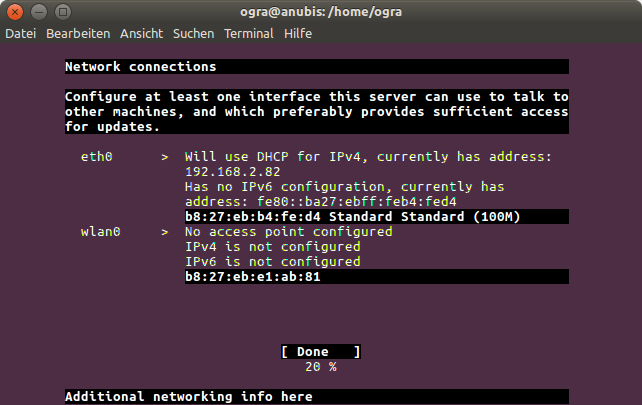 The instructions below walk you through a basic install of UbuntuCore, setting up a WLAN AP, adding an external USB disk to hold data for nextcloud and installing the nexcloud snap. You need a Raspberry Pi3 and an SD card. Create an account at https://login.ubuntu.com/ and upload your public ssh key (~/.ssh/id_rsa.pub) in the “SSH Keys” section. This is where your UbuntuCore image will pull the ssh credentials from to provide you login access to the system (by default UbuntuCore does not create a local console login, only remote logins using this ssh key will be allowed). Plug the SD into your pi3, plug an ethernet cable and either a serial cable or a monitor and keyboard in and power up the board. Eventually you will se a “Please press enter” message on the screen, hitting Enter will start the installer. for app installation and transactional updates. Now that we have installed our basic system, we are ready to add some nice application snaps to turn it into a shiny WiFi AP with a personal cloud to use from our phone and desktop systems. Now you can connect to your new WiFi AP SSID and point your browser to https://192.168.1.1/ afterwards. Add an exception for the self signed security cert (note that nextcloud.enable-https also accepts Let’s Encrypt certs in case you own one, just call “sudo nextcloud.enable-https -h” to get all info) and configure nextcloud via the web UI. In the nextcloud UI install the “External Storage Support” from the app section and create a new local Storage pointing to the /media/usbdisk dir so your users can store thier files on the external disk. So this weekend it struck me to simply combine a WebView with this menu work to ge a shiny bottom navigation menu. I grabbed the recent google plus app from Szymon Waliczek, the latest source of Dekko and some bits from the webbrowser-app tree to combine them into a new webapp-container like framework. You can find an experimental G+ click package (one that surely wins the contest for the ugliest icon) here. The best way I found was to actually build node.js from source on the respective target arch and run “npm install” for the necessary modules, then tarring up the matching dirs and putting them into my snap package tree. This is quite some effort !!! I’m a lazy programmer and surely do not want do that every time I update the package. Luckily there are already binaries of node for all architectures in the Ubuntu archive and it is not to hard to make use of them to run npm install in a qemu-user-static chroot for all target arches and to automate the creation for the respective tarballs. As little bonus i thought it would be nice to have it automatically generate the proper snap execution environment in form of a service startup script (with properly set LD_LIBRARY_PATh etc) so you only need to point node to the to-execute .js file. This brought me to write node-snapper, a tool that does exactly do the above. It makes it easy to just maintain the actual code I care about in a tree (the site itself and the packaging data for the snap). I leave the caring for node itself or for the modules to the archive, respectively the npm upstreams and just pull in their work as needed. See https://launchpad.net/node-snapper for the upstream code. To outline how node-snapper works I took some notes below how I roll the chatroom snap as an example. First we create a work dir for our snap package. To create the nodejs and npm module setup for our snap package we use node-snapper, let’s branch this so we can use it later. Now we move into the package dir and let node-snapper create the tarballs with the “express”, “webrtc.io”, “webrtc.io-client” and “ws” node modules since chatroom makes use of all of them. We unpack the tarballs and remove them. … and branch the chatroom site and packaging code branch. Indeed we now want to test our snap package. I have a RPi2 running snappy at 192.168.2.57 with enabled developer mode, so I can easily use snappy-remote to install the package. I hope we will see some more node.js projects land in the snappy app store soon. A PPA with node-snapper to make it easier installable should be ready next week and if I see there is demand I will also push it to universe in the Ubuntu archive.